Two unarmed store owners thwarted an armed robbery when they fought off two men with handguns. Police report no injuries from the incident but the two would-be robbers eventually escaped. 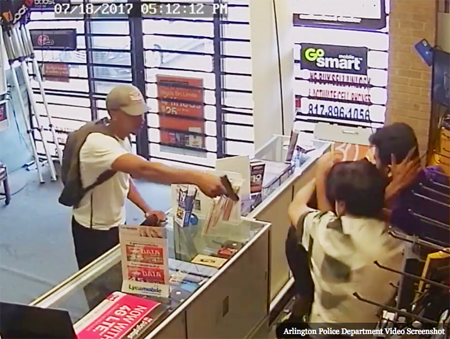 Arlington, Texas, police say that two men entered a cell phone store wearing backpacks armed with handguns. The first attacker pulls what appears to be a small revolver from his bag and points it at the two men behind the counter. When he jumped over the counter, the two store owners began fighting with him and quickly overpowered the man, WFAA ABC8 reported. The second man pulls out a black pistol from his waistband and points it at the store owners who are still fighting with his partner. As the fight continues, one of the owners attempts to grab the second robber’s gun. The fight eventually makes its way from behind the counter to the front door. The business owners continue their attempt to detain the would-be robber but both men eventually escape. He explained he initially believed the guns were toys. One of the suspects dropped his gun during the fight. “After they left, the police said it was a real gun, fully loaded. Luckily nothing happened,” Monga explained. The suspects are described as young black men. Both men wore backpacks. Arlington police officers told the reporters the two store owners are very lucky. They said that the two men could have been killed by the robbers and urged others not to resist a robbery attempt. Monga responded that he has worked too hard since immigrating to the U.S. from Pakistan to have these robbers steal what he has earned. Bob Price serves as associate editor and senior political news contributor for Breitbart Texas. He is a founding member of the Breitbart Texas team. Follow him on Twitter @BobPriceBBTX and Facebook. Originally published on Breitbart Texas.